The only significance of the picture of the B-25 above is that it was the type of aircraft which the main character of Joseph Hellers classic novel 'Catch 22' Captain John Yossarian serves aboard as a bombardier. The popular phrase 'Catch 22' comes from this novel and defines a situation from which there is no escape due to contradictory rules. That is how I feel about the idea of teaching bushcraft in schools; it absolutely should happen, I'm convinced that it would be in the best interest of young people to be taught bushcraft skills, particularly skills which increase their appreciation for and understanding of the natural world. BUT although I think it SHOULD happen I'm equally convinced that school would be a terrible place for that learning to occur. 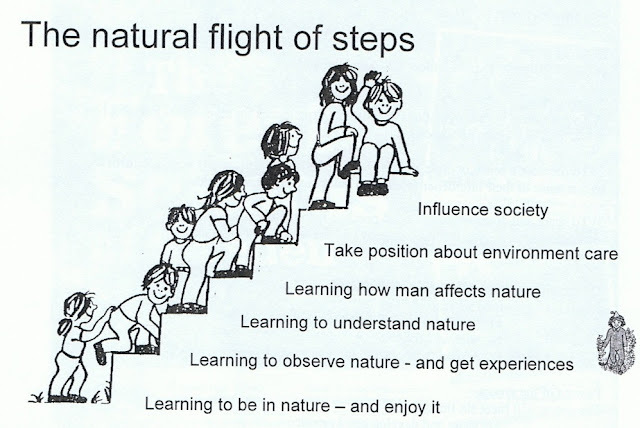 Teaching about the natural world and environment is something which the curriculum is not very good at facilitating and something which schools are notoriously bad at. The situation was almost worsened during Michael Gove's disastrous stint as Secretary of State for Education when he almost succeeded in having topics such as climate change and sustainability dropped from England's national curriculum. For someone with that level of apparent disdain for the environment and sustainability to now fill the role of Secretary of State for Environment, Food and Rural Affairs is frankly disturbing. Although I think learning bushcraft skills is a great way not only to learn about the environment but is also a fantastic way to develop resilience in children as well as benefit their physical and mental health. However; just because I think buschraft skills should be taught to children of school age doesn't mean that school would be a good place to do it. As a further education lecturer, forest schools leader and trainer of forest school leaders and having worked with schools delivering extra curricular environmental education, Duke of Edinburgh's Awards and various other things I don't think schools are really equipped to deliver bushcraft in a meaningful way. Also because schools are so driven by the National Curriculum and a desire to satisfy the whims of OFSTED and be ranked favourably amongst other schools in the area teachers and leadership teams in schools will struggle to justify adding something else to what the school delivers. While many schools do now run very commendable outdoor education programmes the pursuit and delivery of outdoor and environmental education in schools has often been down to the whims of one or two particular teachers who might have a personal enthusiasm for the outdoors or environment. While this enthusiasm might be commendable in an individual it isn't always backed up by technical expertise or subject knowledge. I have seen some excellent good practice amongst Forest School practitioners I have had the privilege of working with and teaching but this is unfortunately not consistent and is demonstrated by people who already have considerable outdoor experience or experience of other skills such as woodworking, bushcraft and who are experienced teachers already rather than by people who are coming to forest schools leadership because they have a little bit of enthusiasm for it and their school has nominated them to run forest schools. In those cases activities come out of books or from the internet and there is little innovation to their programmes and no challenge for the students. Also a lack of environmental knowledge on the part of forest school leaders seriously undermines it's constant comparisons to the more well established outdoor learning programmes from Scandinavia as most British Forest Schools simply can't deliver the quality of environmental learning that could be provided by a subject expert. That's not to say they have to as Forest Schools in the UK is largely focused on social and emotional development and principles such as free play rather than nature as the Scandinavian (particularly Swedish) equivalents are. I have drawn attention to this issue in the past as it affects the outdoor education sector as a whole: There is a well used claim by outdoor educators that outdoor education teaches an appreciation of the environment and delivers the objectives of environmental education and have been quite critical of this claim and highlighted a lack of evidence to support it. One of the reasons for my opposition to this general claim is that outdoor educators are not necessarily subject experts when it comes to the environment. Although the outdoor education industry recognises that outdoor educators need some level of environmental knowledge to be able to answer questions about the areas where they are leading groups but this knowledge is the not the same as the subject specialism and expertise required to teach environmental education. This would be my fear if bushcraft was suddenly added to the national curriculum that a teacher with a bit of enthusiasm for bushcraft and a good collection of Ray Mears and Bear Grylls DVD's would suddenly become the schools 'bushcraft' teacher without the skills and expertise to back up their enthusiasm. Based on the standard wages for forest school practitioners and teaching assistants I doubt very much that a school would be willing to pay a full teachers wage for a specialist bushcraft practitioner unless a serving teacher was willing to teach bushcraft in addition to their other duties and that's where the problem begins. Suddenly you have an inexperienced person teaching buschraft, which devalues bushcrafts contribution to learning and potentially creates health and safety issues if techniques arent taught properly. So that would be my fear for bushcraft if it was taught in schools that it would be done poorly by people who were inexperienced partly because of the education sectors historical reliance on people with an enthusiasm for the outdoors to deliver outdoor elements of their provision and partly because I know, having worked in education long enough, that there would be no proper funding for a bushcraft teachers role if one was suddenly required by the curriculum. These two obstacles would mean that buschraft was taught poorly, possibly dangerously and without the subject knowledge to back up the learning or contextualise it in terms of it's application to other subjects. Ultimately bushcraft won't ever be included in the curriculum anyway because it's outcomes aren't measurable enough or closely linked to priority subjects or progression to higher learning. I think it SHOULD be but it WONT, would be done BADLY if it WAS and CAN'T be because sadly it's benefits aren't recognised by education policy makers. From the high seat; a doze in the high seat.